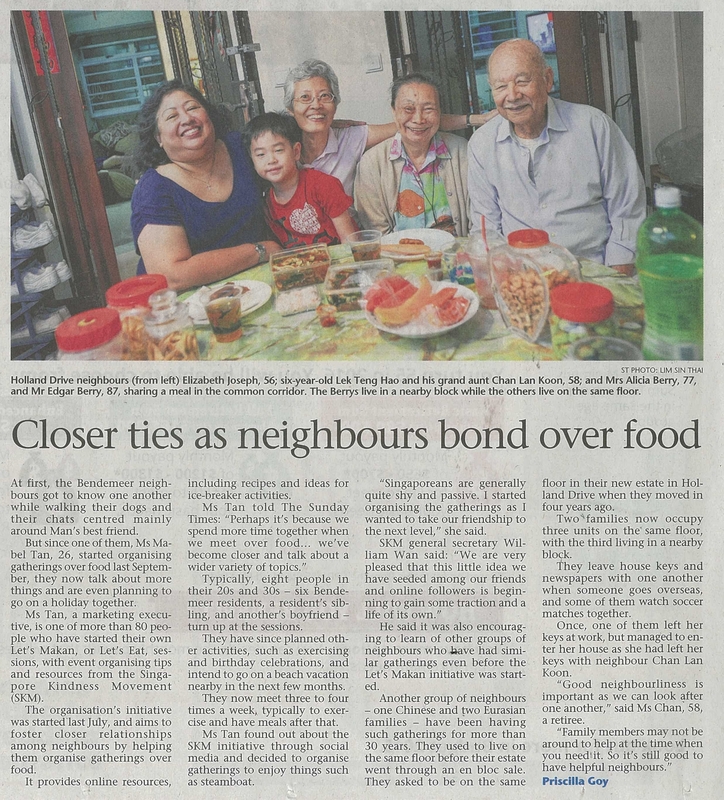 Our neighbourly story was featured on Straits Times on 22nd February 2015! What an honour for me to speak to The Straits Times after my entry submission for Let’s Makan emerge as the finalist. Let’s Makan is an initiative by The Singapore Kindness Movement, to enhance neighbourly ties and gathering of neighbours from different walks of life by sharing a meal together. It hopes to foster closer relationships among neighbours. I find this initiative really helpful as everyone in Singapore enjoys food! Eating together is definitely the best way to get to know one another. By organising food sessions with my neighbours, we came to know each other’s food preferences, type of food we like or dislike, and raving over yummy hawker stalls that we promise to go together. For me, having a bunch of good neighbours living close to me was a great blessing. We are able to look out for one another in times of need and foster meaningful friendship together. This entry was posted in Food, Friends, Public Feature and tagged Bendemeer neighbours, Closer ties as neighbours bond over food, friendship, Good Relationship, Let's Makan, Let's Makan Neughbour, Let's Makan Session, Neighbour Food, neighbourliness, Neighbourly Food, Neighbourly ties, neighbours, Photo Contest, Relationship with neighbours, Singapore Kindness Movement, ST, ST Article, STonline, The Straits Times by Mabel Tan. Bookmark the permalink.